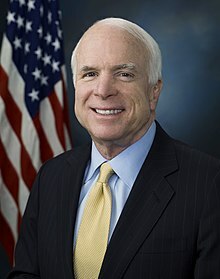 John Sidney McCain III is the senior United States Senator from Arizona and was the Republican presidential nominee for the 2008 United States presidential election. Coco Solo Naval Air Station, Panama Canal Zone, U.S.
John Sidney McCain III (born August 29, 1936) is the senior United States Senator from Arizona and was the Republican presidential nominee for the 2008 United States presidential election. McCain followed his father and grandfather, both four-star admirals, into the United States Navy, graduating from the U.S. Naval Academy in 1958. He became a naval aviator, flying ground-attack aircraft from aircraft carriers. During the Vietnam War, he was almost killed in the 1967 USS Forrestal fire. In October 1967, while on a bombing mission over Hanoi, he was shot down, seriously injured, and captured by the North Vietnamese. He was a prisoner of war until 1973. McCain experienced episodes of torture, and refused an out-of-sequence early repatriation offer. His war wounds have left him with lifelong physical limitations. He retired from the Navy as a captain in 1981 and moved to Arizona, where he entered politics. Elected to the U.S. House of Representatives in 1982, McCain served two terms. He was elected to the U.S. Senate in 1986, winning re-election easily five times, most recently in 2016. While generally adhering to conservative principles, McCain at times has had a media reputation as a "maverick" for his willingness to disagree with his party on certain issues. After being investigated and largely exonerated in a political influence scandal of the 1980s as a member of the Keating Five, he made campaign finance reform one of his signature concerns, eventually gaining passage of the McCain–Feingold Act in 2002. He is also known for his work in the 1990s to restore diplomatic relations with Vietnam, and for his belief that the Iraq War should have been fought to a successful conclusion. McCain has chaired the Senate Commerce Committee, opposed spending that he considered to be pork barrel, and played a key role in alleviating a crisis over judicial nominations with the bi-partisan group known as the Gang of 14. McCain ran for the Republican presidential nomination in 2000 but lost a heated primary season contest to George W. Bush. He secured the nomination in 2008 after coming back from early reversals, but was defeated by Democratic candidate Barack Obama in the general election, losing by a 365–173 electoral college margin and by 53–46 percent in the popular vote. He subsequently adopted more orthodox conservative stances and attitudes and largely opposed actions of the Obama administration, especially in regard to foreign policy matters. By 2013, however, he had become a key figure in the Senate for negotiating deals on certain issues in an otherwise partisan environment. In 2015, McCain became chairman of the Senate Armed Services Committee. Thursday marked the 46th anniversary of John McCain's release after being held captive as a prisoner of war​ at the Hanoi Hilton during the Vietnam War. "I thought perhaps I was going to die," McCain told ABC's Sam Donaldson in a 1999 interview when describing being captured and tortured by the Vietcong. Tim Dickinson discusses the top 5 myths about John McCain. LINK TO ROLLINGSTONE.